Following our lunch of Caribbean-style chicken wings in Crown Heights, we hopped into Kara’s ride and drove to Clinton Hill for dessert at Dough. Gourmet doughnuts are taking their sweet little time coming to Los Angeles, so I try to seek them out wherever they are to be found, even in unknown parts of faraway boroughs. Dough is owned by Chef Fany Gerson, a Mexico City native who studied at the Culinary Institute of America. 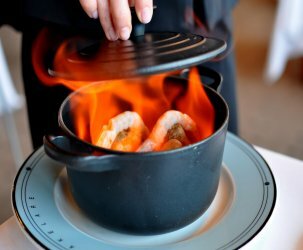 She has worked in notable kitchens around the world including Akelarre in San Sebastian and Eleven Madison Park in New York City. Dough first came across my radar via an inspiring video produced by Food Curated. 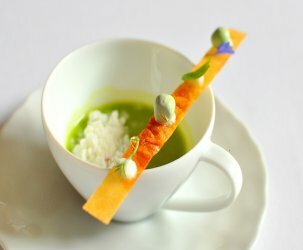 Prior to opening Dough in 2010, Chef Gerson worked tirelessly to perfect the mother dough. She desired a larger-than-average doughnut that was crisp on the outside and light on the inside. After months of trials and tweaks, she finally arrived upon her ideal specimen. 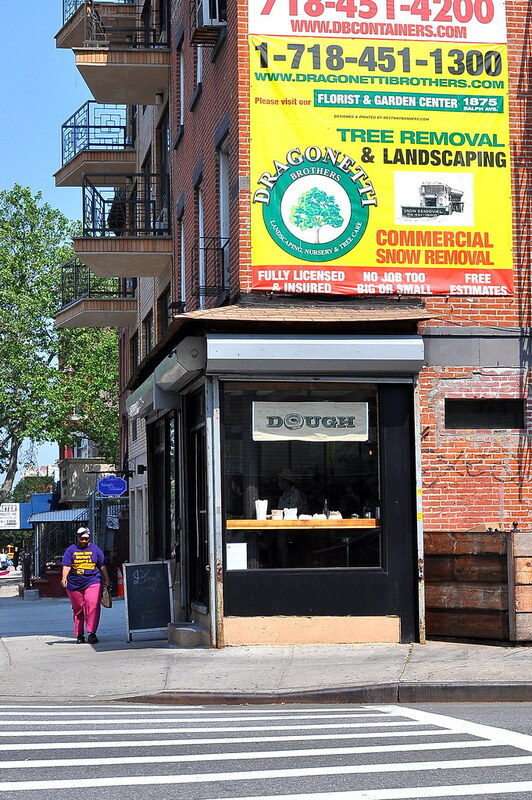 Dough offers a diverse selection of flavors fit for traditionalists and adventurists. There are plain glazed and cinnamon sugar for mild mannered folks, as well as hibiscus and Earl Grey for those seeking a little more flare. Best of all, the doughnuts are made fresh throughout the day to ensure that every customer receives a superior product. 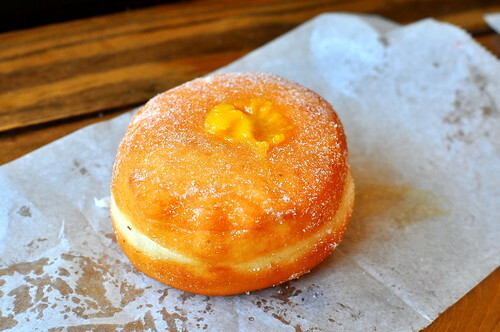 The Astronomer chose a filled doughnut piped with passion fruit curd ($2.50). The sugar-crusted dough was wonderfully pillowy, while the smooth curd was tart and bright. 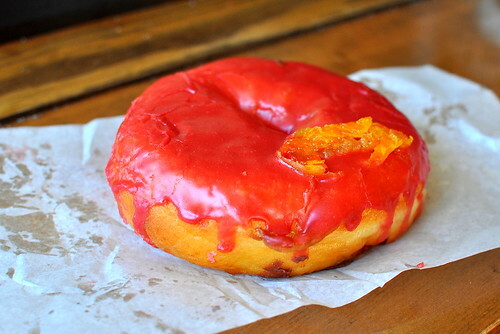 My blood orange doughnut ($2), which was adorned with candied orange slices, successfully captured the nuances of a blood orange in doughnut form. It was simultaneously tangy, sweet, and bitter. I loved the ever-so-light dash of freshly grated nutmeg permeating the dough. Sara’s lemon poppy seed doughnut ($2) looked quite plain next to the others, but flavor-wise it really packed a wallop. The cheery essence of lemon stood out prominently, while the poppy seeds provided texture and that certain something that poppy seeds bring. My favorite doughnut of the afternoon was Kara’s lemon meringue ($2.50), which was filled with lemon curd and topped with caramelized meringue peaks. 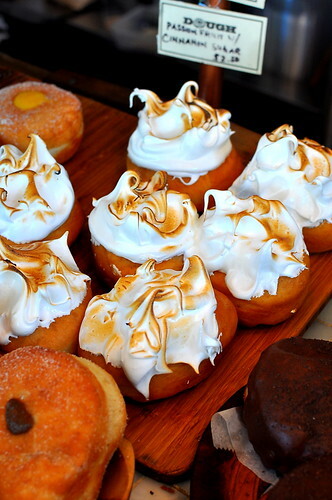 It was a splendid mouthful of soft dough, fruity curd, and sweet meringue—doughnut perfection. I am passionate about doughnuts, and Dough did not disappoint. I could taste the love with every bite I took. 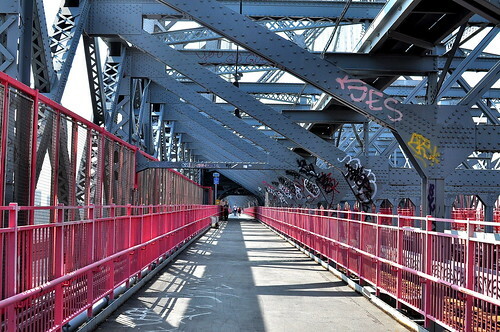 A subway ride to Clinton Hill will be a requisite activity on every future New York City vacation. It’s the right thing to do. 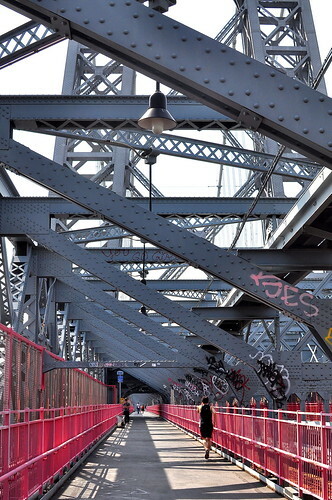 And speaking of the right thing to do, The Astronomer and I walked back to Manhattan across the Williamsburg Bridge to get in a bit of exercise. There are consequences to indulging in a diet of wings and doughnuts, you know. 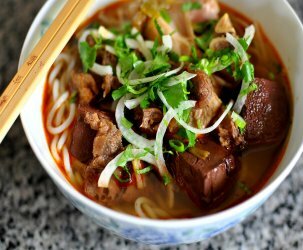 Cathy – the way you describe food makes me drool! Let’s go on a doughnut crawl! Love the unique flavors at Dough & the bridge photos! Did that sign say $4.00 for the Hibiscus donut?!? Cathy-I think you should open up a Gourmet Doughnut shop here in LA. It a niche that needs to be filled! It would also save me a plane ticket to Seattle and NYC. Fat Fudge – Nah, bro. 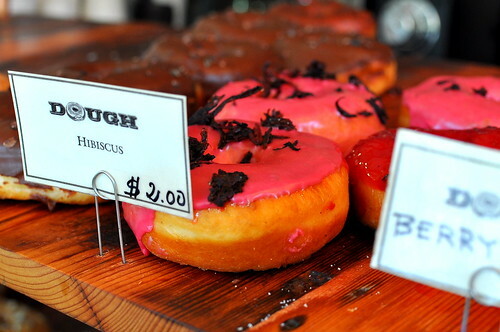 It’s only two bucks for a hibiscus doughnuts. All doughnuts, except for doughnut holes, are in the $2 to $2.50 range. Weez and Bao – Unfortunately, a passion for eating doughnuts does not translate into a passion for running a doughnut shop. Wah wah. Who’s gonna step up to the plate?! 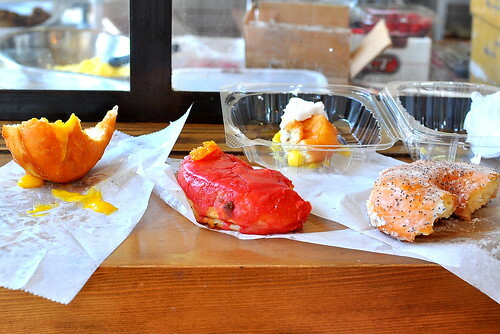 I need a local gourmet doughnuts fix! I love your doughnut posts. 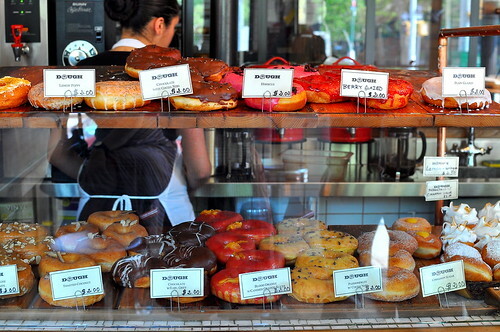 I need a gourmet doughnut shop in SD. When I go to NY, I plan on eating doughnuts everyday. The doughnuts here have really cool decorations and flavors. Will have to add this spot to my list. i didn’t even see lemon meringue when i was there that one sounds so good! Mmmm. That will go on the list of things to do next time my wife and I are up there. Sometimes I feel like you know which destination I am planning on visiting soon and write these posts just for me! AJ and I are going to do our honeymoon in New York City next May. And you can be sure I will be comparing the Doughnut Plant and Dough! holy, holy … doughnut! them hibiscuses are beautiful, and yes, I would like to put Earl Grey in my mouth. damn these look and sound like some fine doughnuts..but why do they have to be so far away. 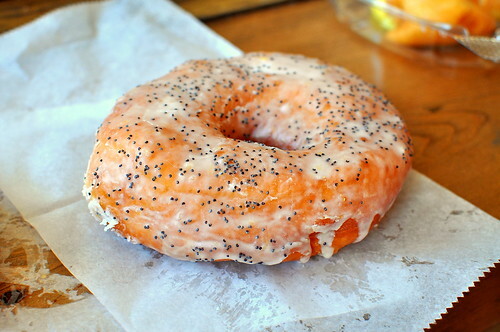 I would kill for one of those lemon poppyseeds or the meringue! Wowza.. got two (glazed, Earl Grey chocolate) at Smorgasburg a few weeks ago.. they are AMAZING! They are so soft and pillowy it’s a wonder how they are even fried. 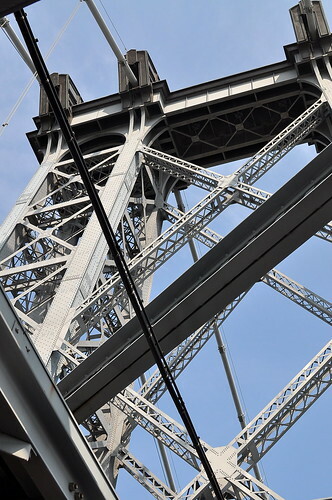 Can’t wait to get back to Brooklyn for these!! Those doughnuts look beautiful, and I love that the proprietress actually cares about the basic building blocks BEFORE the crazy flavors. There seem to be so many places that go for the gimmick (chicken tenders and bacon on a doughnut?) without the serious chops to back it up. I would have dove into the hibiscus, m’self. Pingback: There Are Places I Remember. « Singing, Writing, Traveling…. I love this picture. I link to you blog post in my recent blog I am in Australia and photographed a hibiscus today, and remembered the amazing donut I had from Dough in Brooklyn. 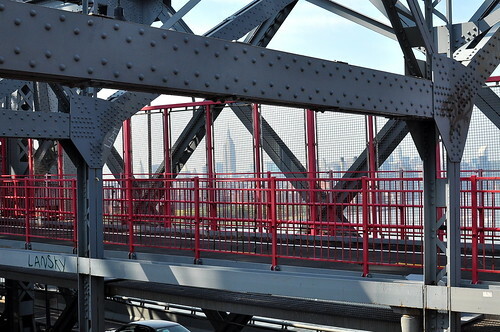 Pingback: Cry-laughing in NYC: Sunday | Because We Do.